Current Situation & Procedure: Take my handful of vitamens and supplements, washed down with some version of Emergen-C, followed by a Zicam swab and nasal spray appertiff. Home base has been moved to the kitchen table, as it is warmer out here and I can easily inhale the tea tree oil scented steam from my vaporizer at my feet. Blow my nose, toss the tissue, massage lotion into my poorly chapped face. Repeat process in 5-10 minutes. I hate being sick. I have valiantly fought off the wandering crud for the past two weeks. 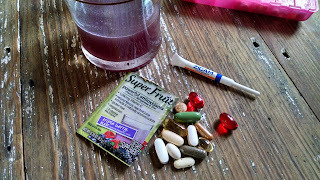 Eating vitamins and supplements like candy. Forcing down two not so great tasting Emergen-C packets a day. However, in spite of my best attempts- it snuck in and took hold of my body while I was wrapped up and distracted by large amounts of stress this week. Understandable my post earlier this week was a little bit more then intense. So- here I am- chugging monster and praying my brain doesn't break while creating this latest masterpiece of a blog. I woke up wanting to get moving and get stuff done this morning. I had the best of intentions when I laid down in bed last night to get up with Hubby and start my day off ticking accomplishments off my to do list. My brain- however- revolted at that idea. I woke up to eye splitting, auras around lights, pounding in my temples, nausea in my tummy pain. Hello hormonal migraine!! Thank you for dashing away any hopes of peaceful happiness. 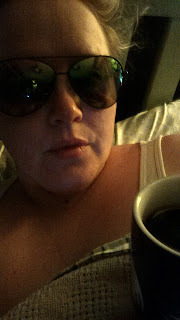 I forced myself from bed to get a cup off coffee Hubby made for me, swallowing my migraine meds with whatever was left from a can of soda left open on the counter overnight, grabbed my sunglasses and curled back up in my warm bed with two snoozing cats.